The Hydra-Matic 4L80 and 4L85 are close-ratio four-speed automatic transmissions that serve the heavy duty truck market, full-size vans, as well as school buses and motor home chassis. The 4L85 was added as a heavier duty version of the 4L80 for the 2002 model year. The 4L85 has heavy duty components to handle increased torque and horsepower requirements. Those components include 5-pinion output and reaction gearsets. Within these gearset assemblies, the smallest gears are the pinions that revolve around the sun gears. Four-pinion gearsets are sufficient for most applications, but adding a pinion gear to the gearsets allows them to handle higher loads. The transmissions incorporate electronic controls which consist of using either a powertrain control module (PCM), or a transmission control module (TCM) interfacing with an engine control module (ECM) to provide consistent and precise shift points and shift quality. These controls continuously monitor shift timing, internal and external conditions, and adjust shifts for consistency. Because the vehicle applications often include trailering, the shift pattern can be selected by the driver to operate more smoothly when towing (Tow / Haul mode). Likewise, shift stabilization limits the amount of hunting between gears when traveling through mountains, with or without a trailer. The only maintenance necessary consists of fluid changes at differing duty cycles depending upon how rigorously the transmission is used in its application. 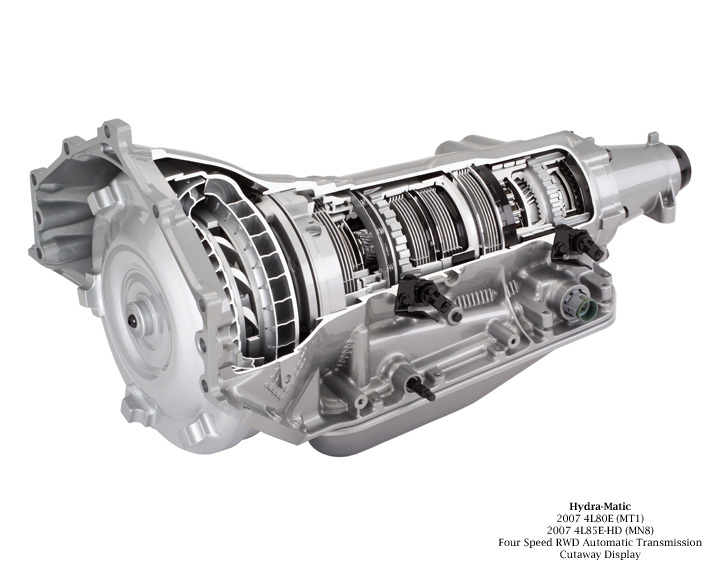 Both 4L80 and 4L85 transmissions use DEXRON®-VI automatic transmission fluid. DEXRON®-VI transmissions fluid was developed to behave more consistently during temperature and other environmental variations, as well as to provide even lubrication of the moving surfaces of the transmission. This fluid is validated in all Hydra-Matic 4L80 / 4L85 transmissions. The 4L80 uses the New Process (formerly New Venture) NP263 2 speed electric shift 4wd and the NP246 2 speed active transfer cases in the GMT800 series trucks.